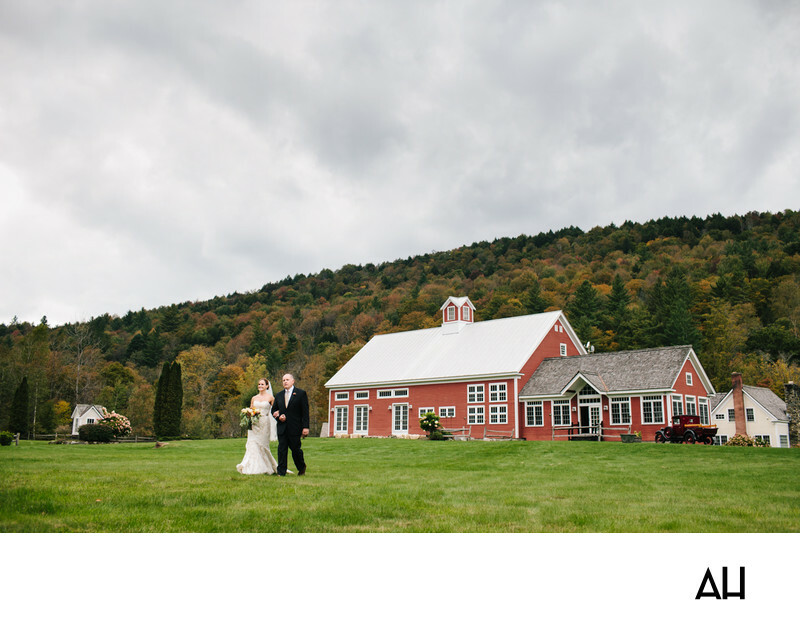 Riverside Farms is a premier venue in the New England area and it provides amazing views for a VT Barn Wedding Photographer. Riverside Farms gives couples and their wedding guests an opportunity to experience an authentic, working Vermont farm with all the luxuries they could want from a wedding venue. This photograph shows the bride and her father walking across the farm’s expensive green fields, with the renovated Red Barn in the background. As this couple’s VT Barn Wedding Photographer, I wanted to capture the bride and groom, as well as their loved ones, in natural settings as often as I could. In this image the bride and her father have begun their walk down the grassy aisle that leads to her husband-to-be. Off camera, guests wait in quiet anticipation for the bride to enter the ceremony area. I chose to keep this picture focused on the bride and her father, because it is such an emotional moment of transition, the instant they take those first steps forward. Autumn foliage rises up behind them and a small white cottage can be seen in the distance. There are no other people in the photograph, just a girl and her dad. The bride’s expression is radiant and full of joy: she is ready to meet her groom and is grateful that her father is able to share this special day with her. The father of the bride is happy, but his expression is more contemplative. As he takes his daughter’s arm in his, the father of the bride can’t help but begin to reminisce. He taught her how to ride a bike and he put her back on the bike when she first fell off, he ran around the backyard with her kicking soccer balls and playing catch, he taught her how to drive a car, and he burst with pride the day she was accepted into college. Now, he will give her away on her wedding day, and while he is feeling a little sad in this moment, he is also incredibly proud of the woman she has been and continues to become.